4th of July Venice Beach Events Schedule - Yo! Venice! Here is a preliminary sampling of events happening in Venice for the 4th of July. If you have an event you would like to invite people to, let us know and we will add it in! Remember to stay safe and sane this 4th of July! Or not! Celebrate America at SMC – 30th Anniversary event should be good! Starts at 4pm, fireworks at 9pm! 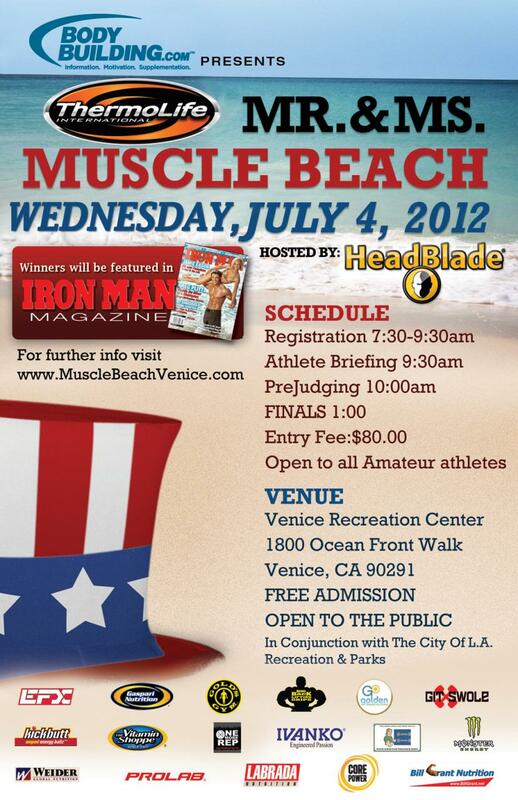 1:00pm Mr. and Mrs. Venice Beach Body Building Competition Finals at Muscle Beach. 1:30pm: 8th Annual Venice Canals Rubber Duckie Race held at Dell and Linnie Canal. 1:30pm: Linnie Canal Downwind Regatta. All boats must be wind-powered only. 2:30 – 4:30: Venice Canals Pot Luck BBQ. Live music by the “Shoo Flies”. Contribution for the BBQ: $5 per person/$10 for a family with kids under 13 or you can bring a side dish or dessert that will serve 8 – 10 people. You must register for the BBQ, contributors will be issued wristbands for the BBQ!.